Lioness has had deep impact since its premiere in 2008 and we are pleased to have provided both post-production support as well as several grants to advance their outreach and audience engagement. We believe it tells a compelling and important story that all Americans need to understand. It also offers many lessons for those who seek to use their films to achieve change. To capture those lessons, we supported the filmmakers’ efforts to document the project’s impact and what they learned along the way. What follows are some highlights drawn from that report. We encourage you to review the entire report, Cultivating Change which is available for download. Lioness is a critically acclaimed documentary film about Army support soldiers who became the first women in American history to be sent into direct ground combat. Without sufficient training but with a commitment to serve as needed, these young women ended up fighting in some of the bloodiest counterinsurgency battles of the Iraq war. Lioness makes public, for the first time, this hidden history. Told through intimate accounts, journal excerpts, archival footage, as well as interviews with military commanders, the film follows five Lioness women who served together for a year in Iraq. Together the women’s candid narratives describing their experiences in Iraq and scenes from their lives back home form a portrait of the emotional and psychological effects of war from a female point of view. Inadequate training due to the combat exclusion policy. Inadequate documentation of their service making which affected their ability to receive appropriate VA benefits. Lack of understanding of the unique mental and physical health care needs of women veterans that are not adequately served by a system based on a male model of care. 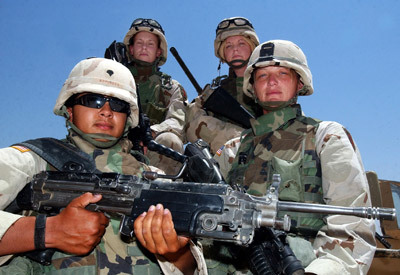 Issues of gender equity (the brass ceiling) due in part to the ban on women in combat. After early screenings and consulting with partners, they decided that the most effective starting point was to focus on women veteran’s healthcare. The National Summit of Women Veterans’ Issues (June 2008), where they reached over 400 people, including women veterans, VA employees, as well as representatives from veteran service organizations, veteran nonprofits, and Department of Defense health officials. The Evolving Paradigms II Conference (September 2009), a large conference for VA and DoD veteran healthcare providers sponsored by the Department of Veterans’ Affairs, Veterans’ Health Administration, and the Women Veterans Strategic Healthcare Group. Its purpose was to refine the system of post-combat care for all those returning from Iraq and Afghanistan. Over 3,000 people attended the screening. The Defense Department Advisory Committee on the Status of Women in Services (DACOWITS) (May 2009), which advises the Department of Defense on issues relating to women in the armed forces. Lioness screened at a DACOWITS conference, and the producers were told that the Committee planned to use some of the information from the film and the discussion following in a formal report. The filmmakers developed pivotal partnerships with the Center for Women Veterans and Disabled American Veterans, both of which provided Lioness with further credibility and access to official military and political leaders and organizations. Center for Women Veterans, an advocacy office within the VA which reviews VA programs and services for women veterans to assure that women veterans receive benefits and services on a par with male veterans, and encounter no discrimination in their attempt to access them. The partnership with the Center for Women Veterans, and by extension with state women veteran coordinators at VA facilities across the country, has led to Lioness becoming institutionalized as an educational and clinical component of women veteran care at the VA.
Disabled American Veterans, a 1.2 million member non-profit veteran service organization dedicated to building better lives for America’s disabled veterans and their families, has become an significant advocate for legislation supporting the issues of women veterans. Lioness partnered with DAV in order to execute its Capital Hill Screening. DAV’s expertise provided Lioness with insider knowledge of the legislative process and ongoing advice on how to navigate the subtle politics involved in bringing a project like this to fruition. Lioness had the opportunity to take part in an event on Capitol Hill in March 2009. 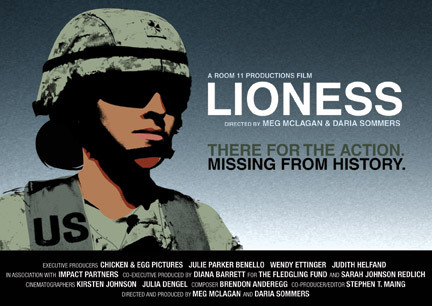 With the help of Lioness’ partners, excerpts of the film were screened before a standing room only crowd of key Congressional members and their staff, veteran service organizations, activist leaders interested in issues affecting military and women veterans, and press. Following the screening, four of the women from the film discussed the impact of their experiences in Iraq. Since its release in 2008, Lioness has contributed significantly to the mainstreaming of the movement to recognize and respond to the needs of American servicewomen. As a catalyst for military-civilian dialogue, the film has led to tangible change in a number of arenas by framing an important but largely invisible issue in meaningful human terms. Among the film’s notable accomplishments is its integration into the national veteran and Department of Defense healthcare infrastructures as a training tool for VA and military healthcare personnel. The film has also played a pivotal role in the passage of two critical pieces of legislation improving women veterans’ access to healthcare in the VA system. The Women Veterans Healthcare Improvement Act, designed to increase availability of gender-specific services for women, was signed into law by President Obama on May 5th, 2010, as part of The Caregivers and Veterans Omnibus Health Services Act. The Compensation Owed for Mental Health Based on Activities in Theater Post-traumatic Stress Disorder Act expanded the definition of combat, making it easier for all veterans to qualify for combat-related disability benefits. More recently, in terms of the film’s long tail impact, the Pentagon has formally committed to gender equity in the Armed Services. This policy shift was influenced by discussions activated by the film between the Department of Defense and members of the House Armed Services Committee and identifies a specific pathway for servicewomen to finally break through the brass ceiling. Lioness capitalized on a well made, probing, and critically acclaimed film, leveraging their festival, broadcast and community screenings to build awareness around an issue that many Americans knew little about. Through this process, they recognized the importance of the media and becoming a credible source in the press and therefore had the opportunity to provide insight on the issue of women veterans. A critical factor in Lioness’s success was connecting with preexisting women veteran networks early in their outreach and community engagement and using those networks to build strong partnerships. Through the VA’s Center for Women Veterans, the filmmakers were able to connect the film to major stakeholders, like the National Summit of Women Veterans’ Issues and veteran healthcare providers around the country. Ultimately, through its partnership with the Center for Women Veterans, Lioness was able to gain credibility and to capitalize on the Center’s preexisting network within the VA community. Similarly their partnership with Disabled American Veterans (DAV) helped them reach policy makers on Capital Hill. The success of Lioness in reaching Capitol Hill and other important military and political players also highlights the importance of face-to face screenings and summits that feature the film’s producers and characters. Throughout its community engagement period, Lioness was screening at summits, conferences, and panels. These event-based screenings provide a more interactive forum to discuss the issues of the film and a more targeted and influential audience. It was through these conferences that the VA came to understand the value of the film as an educational tool in a clinical setting. The producers also were and continue to be flexible and open to using the film in different ways to serve the needs of the women soldiers and veterans and the organizations that support them.